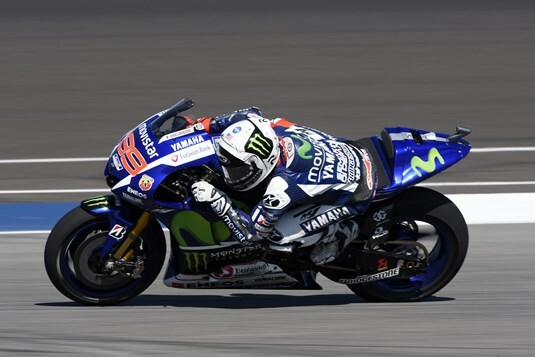 Movistar Yamaha MotoGP’s Jorge Lorenzo impressed with a strong start to the race weekend at the Indianapolis Motor Speedway today. Teammate Valentino Rossi had a more challenging start to the second half of the season, finishing the first practice session in tenth. Movistar Yamaha MotoGP riders Jorge Lorenzo and Valentino Rossi were on track today for the first time since the start of the Summer break for the first free practice sessions ahead of this weekend’s Indianapolis Grand Prix. Having returned from their holiday this was the first opportunity for both riders to re-familiarize themselves with their YZR-M1 and get back into a riding rhythm. Lorenzo needed little time to reclaim his form, finishing the first day in first place with Rossi ending the day in tenth. Lorenzo quickly got a feel for the American track on his first laps in the morning session and needed only seven minutes to take over the top spot from his teammate. He held this position as he began to work on his setting and improve his time until the times dropped at the end of FP1. He answered the challenge and pulled a 1’33.654 out of the hat to lead the morning standings. As the conditions heated up in the afternoon so did the action on track with all riders increasing their pace. Lorenzo kept working on perfecting his set-up and decided it was time to give another push at the end of FP2. He took over the provisional lead before a last minute shoot out moved him back to second, but again Lorenzo saved the best for last and finished at the top of the time sheets with a 1’32.860. Teammate Rossi also set an impressive pace early on during the morning practice session, riding the YZR-M1 to first in the rankings on the first lap. He continued to reclaim the provisional top spot multiple times as the pace of the field quickened. He then moved on to testing solutions to improve tyre life, a common problem at the Indianapolis Motor Speedway due to its lay-out with mainly left corners, ending the first session as fifth quickest with a best lap of 1’34.374. The Doctor worked tirelessly in the afternoon to further improve his setting. Though he didn’t make up any ground in terms of the ranking, he was able to better his time to a 1’33.532, thereby reducing the gap to the front. He ended the session in tenth place. With nearly all MotoGP riders having improved their times in the second practice, today’s results see Lorenzo hold first in the combined session times, with Rossi 0,672s behind in tenth position. Pol Espargaro kicked off the second half of the 2015 MotoGP season with a firm run to 6th on the opening day of practice at the Indianapolis Grand Prix aboard the Yamaha YZR-M1. The MotoGP field initially had to deal with a lack of grip on the Indiana asphalt, yet despite this, Espargaro jumped straight into gear and pushed hard to conclude the opening practice in 8th position with a time of 1’34.669. When the afternoon session commenced, the young Spaniard, who has recently re-signed with Yamaha to ride for the Monster Yamaha Tech3 Team for the 2016 season, continued his shake down in preparation for the 27 lap race on Sunday. He set his personal best of 1’33.362 on the 18th lap, yet unfortunately fell as he tried to improve this time on the following lap. Nevertheless, the 2013 Moto2 World Champion was not injured and his performance saw him claim 6th as he finished merely 0.207 back from third place. He now looks onwards to tomorrow, where he will aim to clinch a strong qualifying position for the race on Sunday. Meanwhile on the other side of the Monster Yamaha Tech3 Team garage, Bradley Smith concluded the first day of action after the three week MotoGP summer break with a run to 9th position as the Indianapolis Grand Prix got underway. The British star, who fully intends to reignite his strong form from the opening nine rounds, endured a tricky start in the morning practice as he finished in 16th after suffering with the lack of track grip. Despite this, he jumped straight back onto his MotoGP bike when the afternoon session began and continued taking the necessary steps forward with his Monster Yamaha Tech3 Team by adjusting the base setting of his YZR-M1. After completing 24 laps around the 4.2 kilometre circuit, which was more than any other MotoGP rider, Smith met the chequered flag with a time of 1’33.474, which was merely one tenth of a second behind his teammate. Tomorrow, he will carry on his assault as he aims to finish the weekend once again as the leading satellite rider.